Experiments conducted at the Institute of HeartMath have found remarkable evidence that the heart’s electromagnetic field can transmit information between people and that one person’s brain waves can actually synchronize to another person’s heart. These findings have intriguing implications, suggesting that the nervous system acts as an “antenna,” which is tuned to and responds to the electromagnetic fields produced by the hearts of other individuals. There is also intriguing evidence that heart field interactions can occur between people and animals. In short, energetic communication via the heart field facilitates development of an expanded consciousness in relation to our social world. 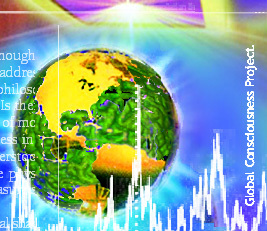 Additional support to the title comes from researchers at the Global Consciousness Study. Their findings, while nowhere near complete, show hugely significant evidence that we all may be far more connected than we think. The Global Consciousness Project (GCP) is an Internet- based experiment led by Princeton University's Dr Roger Nelson and is cosponsored by the Institute of Noetic Sciences. 14 years ago the researchers began placing random number generators (RNG) all across the world. RNG are devices which are connected to a computer with a user/s sitting next to them. They constantly spit out random unpatterned numbers. Each RNG provides sequences of truly random bits (0s and 1s) at the rate of about a thousand per second. The researchers had hypothesized that the outputs of these RNG's can be effected by the people sitting next to them. Therefore, these outputs are monitored by a personal computer (PC) which collects 200 random bits into one "trial" per second and records these trials in time-stamped files. All of the PC clocks are synchronized to standard Internet time. Packets of random data from each PC are periodically transmitted over the Internet to a computer in Princeton, New Jersey, for archiving. As of now, there are more than 65 RNG's located in Europe, the US, Canada, India, Fiji, New Zealand, Japan, China, Russia, Brazil, Africa, Thailand, South America, and Australia. They have further even developed portable RNG's that can be connected to a PC. GCP have recently released their data collected from August 1998 to JAN of 2013. The study has found that there is a deviation from the randomness of these number generators on a global scale during the period of a major global event (disaster or a celebration) which is influenced by the person/s sitting next to it. These recording are considered far more than pure chance should allow, coinciding with “global events”. For example, just hours before the first plane hit the towers on 9/11, researchers began noticing huge spikes in the number of hits received, an anomaly they first saw when Princess Diana died. These spikes continued to appear around airplane crashes, volcanic eruptions, tsunamis, and even events like the opening ceremony of the Olympics. Possible Conclusion: The movement of energy has a coherent order affecting all hearts and consciousness and that the positive emotions, such as love and appreciation are the conducing energies.